I’ve just finished looking at the monthly sales report for May and am happy to report that, as of last month, more than 1,000 copies of The Blood ‘n’ Thunder Guide to Pulp Fiction have now been sold. That’s not bad for a small-press “niche” product released a year and a half ago with no significant advertising or promotional effort. Sales of the Guide were quite strong for the first six months, then lagged for a little while only to pick up again last year for reasons unknown. Approximately 15 percent of the sold copies have gone to international buyers. As one would expect, most of those went to English-speaking countries—Canada, Australia, and the United Kingdom—but quite a few have found their way to European Union and Pacific Rim companies as well. I’m also been gratified to see the Guide to Pulp Fiction being used as a text in college courses (and not only because that results in individual orders of two dozen or more copies). It was always my hope that this tome—like its predecessor, The Blood ‘n’ Thunder Guide to Collecting Pulps—would become a trusted reference work as well as a hobbyist’s handbook. The community of pulp collectors might be dwindling as innumerable reprints and facsimile obviate the necessity of purchasing the vintage magazines for reading purposes, but with interest in the fiction growing slowly and steadily, the need for a reliable, comprehensive guide is arguably more pronounced than it ever was. Having reached this milestone somewhat earlier than I expected, I’m now more eager to see the Guide reach a wider audience. Beginning today, I’m going to offer it at $19.95—two-thirds of its stated retail price—to first-time subscribers to Blood ‘n’ Thunder. You can take advantage of that deal here. Copy #2,000, here we come! Congrats, Ed! That’s great news. I’ve got both books. 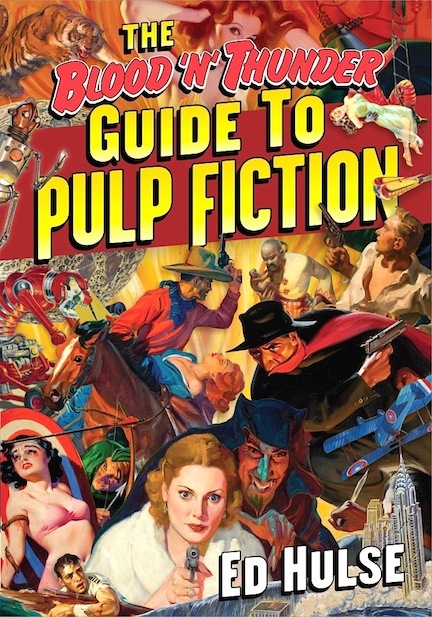 If anyone has the first book and is undecided about the new Guide to Pulp Fiction, don’t hesitate about picking it up. It’s a great addition to your bookshelf. I agree with Bill. I like most books about pulps but your Guide has been the most useful to me. Its a great all around reference especially to newbies like me. By the way congratulations on your milestone.